The Cornetto Trilogy Golden Mile, Day 4: The World's End Giveaway! Are you ready for the Golden Mile? The famous pub crawl in the quiet BRitish town of Newton Haven has gotten the best of many over the years, but next week five friends are going to reunite and give it another shot-- and you're invited to join them on their quest, which will be unlike any pub crawl you've actually seen before. In The World's End, director Edgar Wright reunites with stars Nick Frost and Simon Pegg for yet another genre mash-up, combining the nostalgia for high school years with a surprising revelation that bucolic Newton Haven has been overtaken by… robots. How they fight the robots and escape intact is part of the adventure in The World's End, which wraps up the Three Flavours Cornetto trilogy that started with Shaun of the Dead and Hot Fuzz. 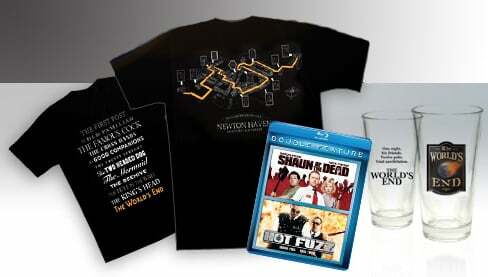 And if you're as excited for The World's End as we obviously are, we've got the perfect prize pack to send your way. One lucky reader will receive a $100 Visa gift card (for use on a night out with friends, of course), along with a Golden Mile T-shirt, a pint glass, and a double-feature Blu-ray of Shaun of the Dead and Hot Fuzz, perfect for marathoning before you go see The World's End. You can see (sadly low-res) image of all the prizes, along with a better one of the pint glasses, below. In addition, three runners up will get the T-shirt and the pint glass, which should serve you well on your own pub crawl adventures. How do you enter? Just click on over to our Facebook page, "Like" it if you haven't already, and then leave a comment on this contest post. Tell us your favorite Cornetto Trilogy movie and why, and we'll pick one winner and three runners-up at random. The contest ends at 12 am EST on Monday, August 26th. If you enter, please make sure we can contact you via Facebook. If you have it set to where we can't message you, your prize will go to somebody else. For more on our Cornetto Trilogy celebration, you can check out some glow-in-the-dark Cornettos, explore an interactive version of the Shaun of the Dead screenplay, and check out some of the best fan art that the trilogy has inspired. 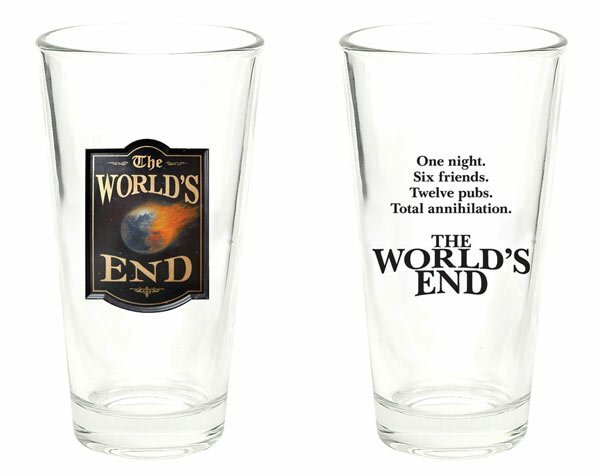 You can also watch the trailer for The World's End below, and raise a pint glass to one of the best unofficial film trilogies of all time.